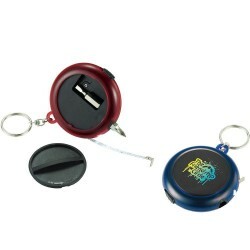 Promotional tape measures are a perfect corporate gifts. Go the extra mile to impress your customers with these printed tape measures as your promotional giveaway during tradeshows and conferences. 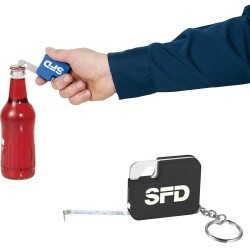 They make valuable business gifts as they are practical and handy. 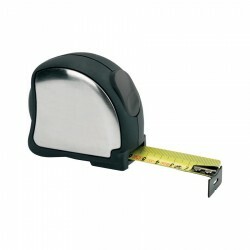 At Promotional Product Experts, we offer custom printed tape measures in different styles and lengths. 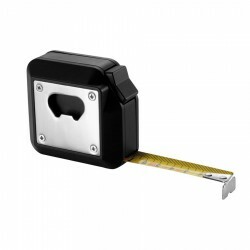 We have branded tape measures for professionals and for everyday use. All items can be printed with your brand name or logo. We encourage you to place bulk orders to enjoy more savings. Call us today to find out more! 8 metre/26ft heavy duty ABS and rubber tape measure, Steel tape, belt clip, tape stopper. • 5m retractable metal tape measure • Metric and Imperial measurements • Rubber exterior with wrist strap and metal belt clip • Features 3 diff erent buttons conveniently located to lock the tape measure in place. Four colour process digital decal. Individually packaged in a white box. • 760cm x 25.4mm wide retractable metal tape measure • Metric and imperial measurements • Rubber exterior with wrist strap and metal belt/pocket clip • Features 3 diff erent buttons conveniently located to lock the tape measure in place. Four colour process digital decal. Individually packaged in a white box. A multi-function tape measure tool equipped with a level, sticky notepad set, yellow plastic pen, belt clip and a 3 metre tape measure with both imperial and metric measurements. Individually packaged in a white box. Set includes 6 carbon steel screwdriver bits (2 hex, 2 flathead, 2 Phillips-head) on sides of tool. 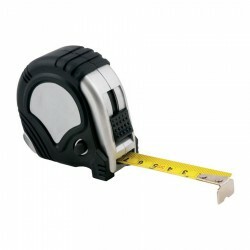 99cm retractable metal tape measure. Single white LED light. Slide on/off power switch. Magnetic base. Button cell batteries included and inserted. 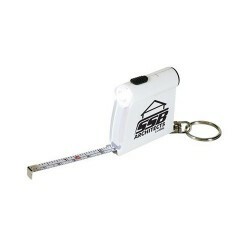 Set includes 99cm retractable metal tape measure, single white LED light & screwdriver kit. Twist-off cap on back to find 2 metal screwdriver bits (Phillips & flat head). Slide on/off power switch. Metal split key ring. 3-in-1 multi-tool. 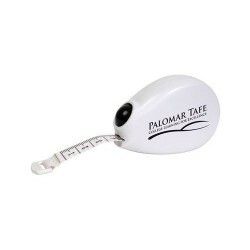 89cm retractable metal tape measure with standard and metric measurements. Single white LED light with slide on/off power switch. Swivel metal bottle opener. Includes metal split key ring. 3 metre retractable tape measure. Standard and metric measurements. Rubber casing. Sturdy plastic wrist strap. Slide locking button locks tape in place. Metal belt clip on back. 7.5 metre retractable tape measure. Standard and metric measurements. Rubber casing. Rubberized wrist strap. Slide locking button locks tape in place. Metal belt clip on back. 3 metre retractable tape measure. Standard and metric measurements. Rubber casing. Sturdy plastic wrist strap. Slide locking button locks tape in place. Metal belt-clip on back. 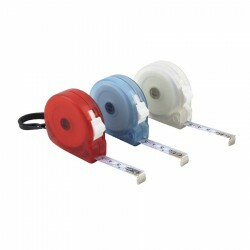 3 metre retractable, locking tape measure. Built-in level. Includes 44mm x 44mm yellow sticky memo pad, mini pen and metal belt clip. Locking button on bottom of item keeps tape in place. Clear flip-top cover protects memo pad. 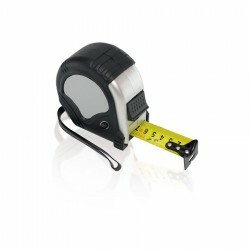 99cm retractable, locking tape measure. Standard and metric measurements. Slide-locking button locks tape in place. Rubber grip. Metal split-ring key chain. 152cm retractable tape. Standard and metric measurements. Tape automatically stops at desired distance when extracted. Quick-release button rewinds tape into case. 3 metre retractable tape measure. Standard and metric measurements. Woven nylon wrist strap. Slide-locking button locks tape in place. Metal belt-clip on back. 5 metre/16ft tape measure, Stainless steel & black rubber body, steel tape, belt clip, tape stop button. Heavy duty quality finish, Black rubberised detail, 3 metre metal tape measure, Metric and imperial, Tape stop button on side, Handy tape hold button at back, Carry strap, Belt clip. Heavy duty metal case with plastic detail, Metric and imperial, Durable 5m metal tape, Tape hold button, Belt clip. Heavy duty metal case with plastic detail, Metric and imperial, Durable 8m metal tape, Tape hold button, Belt clip. 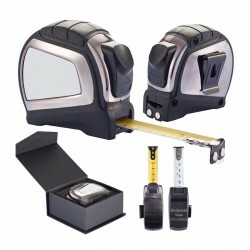 Includes belt clip, pen, note pad, spirit level & 2m/6f tape measure. Black case, Yellow pen, notepad, & push button for tape measure, with Silver clip. Packed individual white gift box. Cloth 150 cm / 60 inch tape measure. Metric 1 side and imperial calibrations 2nd side. Push button ball action retracts tape. 1.5m polyester tape push button retract action. Tape - Metric 1 side, imperial other side. 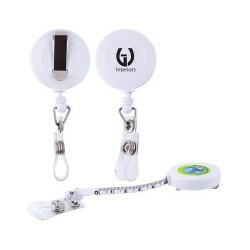 Clip on badge holder with 100cm retractable PVC tape measure. Features 10 foot 300cm metal tape with metric and imperial calibrations, plastic case painted Silver with internal magnet. Logo spins when tape is retracted. Handy retractable tape measure. Boxed. 2 metre tape measure with frosted clear casing. 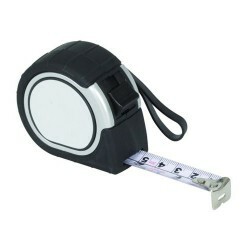 Heavy duty retractable tape measure, 10 metres long and ideal for the handyman or around the office. Boxed. Stainless steel and rubberised finish case, includes belt clip. Magnetic black gift box. 5 metre tape measure with built-in bottle opener. Soft touch ABS case. Registered design. Boxed. Combining a 5m tape measure, 8 digit calculator, note pad and super-bright LED torch into 1 useful tool. WorkMate 4.9 metre Tape Measure 4.9 metre retractable metal tape (inch and metric measurements). Lock button. Rubber casing with wrist strap. Metal belt clip.